From the biggest bunny to the largest egg hunt, these amazing world records have got us in the mood for a spot of choc! It took a massive 12,773 entrants to crack the world record for the most entrants to an Easter egg hunt back in 2012. ‘The Fabergé Big Egg Hunt’, which helped raise money for the charities Action for Children and Elephant Family, saw competitors try to find 200 eggs around London over six weeks. Blimey! We wouldn’t mind finding one of these on our Easter egg hunt! Made and measured in Italy in 2011, this giant egg weighed a whopping 7,200kg and had a circumference of 19.6m! We wonder how many people it took to devour this gigantic treat?! In Germany, it’s traditional to celebrate Easter by hanging hollow eggs from the branches of trees. We’re surprised this (luckily very sturdy!) tree managed to hold the weight of 76,596 painted hens’ eggs back on 8th April 2007. This beauty was created by William Curley, Amy Rose Curley, Alistir Birt, Sarah Frankland, Melissa Paul and Rhiann Mead from the UK, as well as Suzue Curley from Japan. It was sold for an incredible £7,000 during an auction at the Royal Courts of Justice in London on 20th March 2012. Now that’s one lucky bidder! With 501,000 eggs to find, it took 9,753 children and their parents to complete this mammoth Easter egg hunt. It took place in the Cypress Gardens Adventure Park in Florida back in 2007, and we reckon the kids will still be talking about it now! This bunny puts Dumbo to shame. 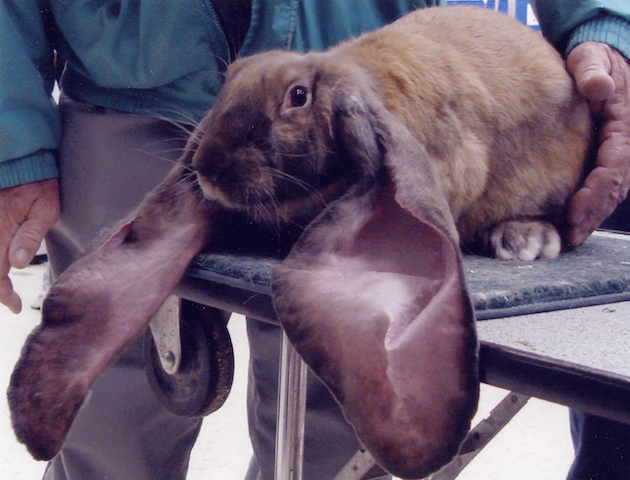 Fur from your average rabbit, in November 2003, the English Lop called Nipper’s Geronimo achieved the accolade of longest rabbit ears, as his velevty-soft lobes measured in at a hopping mad 79cm (31.125in)! When measured in April 2010, this Flemish giant rabbit was found to be an unbelievable 4ft 3in long – that’s slightly taller than the average height of an 8-year-old girl! He’s owned by Anette Edwards in the UK – and we bet he gets through a lot of carrots! Just to add to these fun Easter records, here’s a video demonstrating the most eggs in cups blown upside down in one minute – who would have thought? Would you fancy having a crack at breaking any of these egg-citing Easter records?